Lovibonds has taken awards in both the World Beer Cup and World Beer Awards ceremonies where our beers were up against tough competition from all around the world. Nationally, we’ve won several SIBA awards for our bottled beers and 3rd best keg beer at the Milton Keynes CAMRA Beer Festival. We’ve also won Gold, Silver and Bronze in the commercial beer category at the UK National Honey Show with our Gold Reserve. 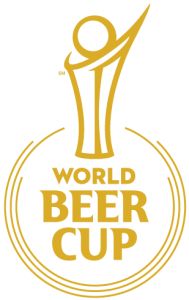 The World Beer Cup, often referred to as “The Olympics of Beer Competitions,” is the most prestigious beer competition in the world. In 2012 we took on over 4000 beers from over 800 breweries from 57 countries to take the Gold Award with our Sour Grapes in the Wood and Barrel Aged Sour Beer category. Find us on the winner’s list under category 23 for Wood & Barrel Aged Sour Beer here. Jeff first learned how to brew by reading Charlie Papazian’s “The New Complete Joy of Home Brewing”. Some 17 years later, here is Charlie handing Jeff his Gold Award. The World Beer Awards are the global awards selecting the very best internationally recognised beer styles. 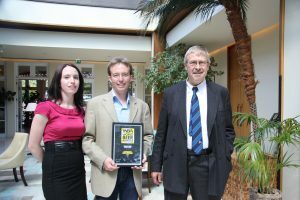 In 2009 we won World’s Best Honey Beer for our Gold Reserve and also a Highley Commended for our Henley Dark Smoked Porter. 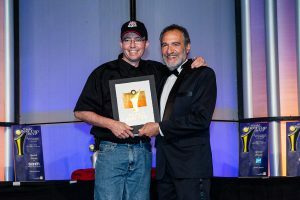 Jeff being awarded the World’s Best Honey Beer by competition organiser and beer writer Roger Protz.